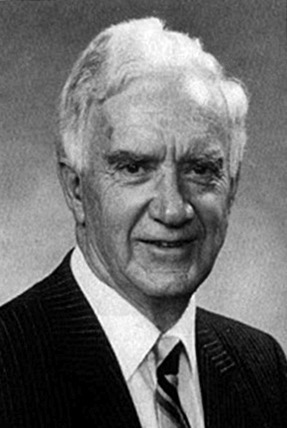 Broughton Knox, Principal of Moore College 1959–1985, former President of the ACL, and leading theologian died in Sydney on January 14th 1994. Broughton’s funeral at Sydney’s St. Andrew’s Cathedral was attended by a host of friends and former students. Archbishop-emeritus Sir Marcus Loane preached at the service on January 19th. We reprinted his address in the March 1994 ACL News with the author’s kind permission. Broughton’s sudden illness and death sent a shock wave throughout both family and diocese. On Tuesday morning, he was at Summer School; afterwards he entertained Dr. Carson at lunch. Then at midnight, or a little later, he was stricken with a severe cerebral haemorrhage. He was transferred from Katoomba to Prince Alfred, but never regained consciousness. We have now come to lay him to rest with great sorrow for a loss we can ill afford. But we thank God upon every remembrance of a good and faithful servant. There were many strands in Broughton’s complex make-up as husband and father, teacher and friend. But all who knew him know that his life was ruled by a profound faith in God. That life was to span just a shade over seventy seven years from the time of his birth. And they were years crowded with quiet achievement as well as moments of high drama. It was a life rich in friendship, in world-wide contacts, and in special fields of service. And it has left a mark for God that will endure in and beyond his own generation. Broughton was born in an Adelaide rectory but grew up as a son of this Diocese. He was always fonder of books than of games, and read books beyond his years as a schoolboy. He took his degree in Arts at Sydney, a B.D. and M.Th from London, and a D.Phil at Oxford. As a graduate of three Universities, his experience was exceptionally wide and varied. After his Ordination in the Diocese of Ely, he served for two years as a Cambridge Curate. Then as a Chaplain in the Royal Navy – when he was off-shore for three months after D. Day. The immediate post war years were somewhat chequered though he joined the Staff of Moore College. The great turning point was his marriage to Ailsa Lane and his departure to Oxford in 1950. He returned from England to become Vice-Principal in 1954: the start of a new era: and he came into his own in 1959 when he took up the mantle of Principalship. Twenty six years followed in which he ceaselessly pursued standards of excellence – as in the choice of staff, the curriculum for students, the development of the Library. Broughton’s light cannot be hid – it was to shine far beyond College precincts. As early as 1941 he had joined the Biblical Research Committee of the IVF in England. Douglas Johnson often recalled Broughton’s sevenfold “No, No, No…”, as he voiced his dissent. All his life he went on saying “No” persistently and effectively to whatever he perceived to be wrong. Then in 1947 his name came to the fore through another surprising issue in Sydney. He was called as “an expert witness” before the Chief Judge in Equity in the Red Book Case. He was cross-examined by Mr F.W. Kitto K.C., himself later a Supreme Court Judge. Kitto was baffled and threw down his papers, the only time he was ever rattled by a witness. Broughton’s stand in scenes like these was to repeat itself from time to time in wider circles, e.g. on Archbishop Mowll’s nomination he became a member of the Australian Council of the World Council of Churches. But his contribution was too strong for the more liberal emphasis then predominant. He was never afraid of controversy and often stood unabashed at the heart of a storm. Broughton soon began to make his voice heard in the Diocesan Synod and Standing Committee. When he became a member of General Synod in 1954, he was promptly placed on the Constitution Committee. Through The Australian Church Record his views received the widest publicity and his activities continued to cross a wide spectrum of church life and affairs. He served on the General Synod’s Commission on Doctrine and on Canon Law. He became President of the NSW Council of Churches and was responsible for a weekly broadcast. He worked hard to establish the Halls of Residence and the New Universities College Council. In his travels overseas he won widespread recognition both in England and in the USA. His D.Phil. thesis on The Doctrine of Faith in the Reign of Henry VIII is a standard work of reference. And his book The Everlasting God struck out a fresh and original line of approach. He was like a patriarchal figure for successive generations of ordinands. And he continued to be the oracle to whom they turned for counsel and guidance. Broughton relinquished his office as Principal of Moore College in February 1985 but he continued to lecture in Theology on a part-time basis for four more years. Then his dedication both to theology and the training of men led to a new venture for God. He left Sydney in January 1989 to go and found a new Theological College in South Africa. He was 72 years old and he went out to serve a small embattled Church – a Church in a country racked by political turmoil and racial violence. He and Ailsa took up residence in Kalk Bay and opened George Whitefield College for black and white. He had to struggle for funds, for books for the library, for housing for students. When he retired four years later, in December ’92, he left the College as a steady going concern. It had been the crowning work in a ministry of great distinction and personal dedication. His work done, he had barely more than twelve months to live. These were his great joys – he saw his youngest daughter married in September and his younger son ordained in December. Broughton’s home life, academic record, college career, general ministry speak for themselves. There were always strong emotional currents in his make-up, they broke the surface now and then. But the driving force in his daily life as a public figure was a powerful intellect. Broughton was a theologian who brought a fresh and original mind to his thinking. Is there perhaps some special text that sums up all that he stood for? I choose one of many because it points to the grand and constant theme of all his teaching. “This is life eternal, that they might know thee, the only true God, Jesus Christ whom thou has sent”. We all want life, we want life now. How much more life when this life is done! – life eternal. And the secret is the knowledge of God, the one true God, the God who spoke by the prophets. God has spoken, we must listen – and Broughton made this abundantly clear to the last day. The God who spoke by the prophets revealed Himself in the fullest degree in the Son whom he sent. If we would know what God is like, we must hear His voice in his Word and see His Face in his Son. And for Broughton himself? Earthly things have passed away, now he knows even as he is known. Broughton Knox had a profound influence on the shape of the Anglican Church in Sydney and further afield. As a lecturer at Moore College, and then as Principal for 26 years, Dr. Knox (in conjunction with others, notably Bishops Marcus Loane and Donald Robinson) brought a quiet revolution to an already strongly evangelical diocese. During his Principalship, Moore College was transformed from a denominational Evangelical College to a more broadly based Reformed College, while still retaining its Anglican roots. Generations of graduates from Moore College have continued the application of God’s Word they learned under “DBK”. In lectures he was often controversial – indeed, he delighted in summoning reactions from his students – so as to draw them into debate. He enjoyed telling you that your pet idea had been declared to be heresy centuries ago! One of the greatest tributes to DBK’s work is that in recent times his insights into the Bible and the doctrine of the Church no longer seemed as radical as they had to earlier generations – so effectively had his students taught what they had learned. Others will evaluate Dr. Knox’s contribution to theology (e.g. see the article by Dr. Robert Doyle to be published in The Briefing). Not only was he Principal of Moore College and a member of Synod and Standing Committee, but Broughton also served as ACL President in the 1960s and ’70s. He always maintained a close interest in the League’s work, even while in South Africa. He and Ailsa were special guests at the League’s AGM in July 1993, at which he gave the address. “In noting the sudden death of Dr. D.B. Knox, the Council wishes to record its deep sense of loss, its gratitude to God for Broughton’s friendship, wise counsel and leadership, and recognises his example of a faithful teacher and champion of biblical truth in the church of God. “Turn your eyes upon Jesus” was sung at the service at Dr. Knox’s graveside. Whatever one thought of Broughton Knox, all will agree that he was a servant of God who always sought to turn others to the Lord Jesus Christ and his word. We can thank God for DBK and for the legacy he has left us. Top photo: Moore College. Second photo: George Whitefield College.